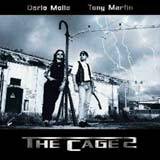 Tony Martin and Dario Mollo return with their sophomore offering, The Cage 2. I was excited to pop this CD in my stereo given the fact that I have always like Tony Martin's voice. In fact, Black Sabbath's TYR album is one of my favorite Sabbath albums and certainly shows off the talent of Mr. Martin. With the exception of one song, Balance of Power, the music of The Cage is vastly different from the TYR days of Black Sabbath. This album is a nice offering of melodic hard rock. There is a moderate bluesy feel to the album with the Deep Purple / Rainbow style keyboard textures throughout the album. Fortunately, the excellent guitar work of Dario Mollo stays in the forefront of the sound where it belongs. The keyboard level is turned low enough to remain in the background and avoid drenching the songs. Mollo provides a constant supply of shred work and solos which coupled with the outstanding vocals of Tony Martin make for some killer songs. I feel that the harmony vocals aren't used frequently enough during the course of the album. Martin sings most of the songs on his own without the inclusion of backing vocals. As a result, the songs don't have the sense of urgency as they would with big harmony vocals and sound a bit monotonous. Of course, Martin's voice is one of the best in the genre, but some additional use of backing vocals could only help. The guys go for some experimental sounds during Life Love and Everything which in my opinion results in a throwaway track. The intro features a brief rap beat (arrrr!) but some nice shred work by Mollo. Martin's vocals are distorted at the beginning of the song and again at the end which really doesn't suite the song and certainly doesn't fit in at all with the other material found on the album. Dazed and Confused is another song that is pretty off base compared to the rest of the album. This is a slow track with some Zeppelin / stoner influences that seems very out of place on this album. So, the album does have a couple of tracks that disrupt the flow of things, but there are enough good songs to pick up the slack. Overall, this is an enjoyable melodic hard rock album with excellent vocals and superb guitar work. The production is excellent each instrument and Martin's voice are crystal clear at just the right sound level. I could have done without a couple of tracks and would have been happy to have heard some bigger harmony vocals. But still, there is a lot to like here and I think fans of blues tinged hard rock especially will want to at least check this album out.